John S. D. Eisenhower, son of President Eisenhower, writes this concise biography on President Zachary Taylor for The American Presidents Series. That series is at its best on the lesser known president’s because it enables you to quickly read a biography and move on to the next president. Our presidents are mostly a mediocre lot from Van Buren to Buchanan besides, perhaps, Polk. On the other hand, if you give equal weight to these presidents pre-presidential careers, Taylor is one of the most interesting. He was the leading general of the Mexican War. It doesn’t hurt that we without question won that war and added vast territory to our nation. To me, Taylor is far more important in our nation’s history as a general than as a president. Taylor is shown as a soldier’s soldier. This book well relays his exciting moments (plus a few that weren’t so exciting). At times, his strategy wasn’t above questioning either. He caught a few breaks and called a few good ones too. What could never be questioned was his courage. His traits matched his soldier life–loyal, diligent, and willing to face hardships. The author was a soldier as well and was in his wheelhouse in describing this overarching aspect of Taylor’s life. The author tells us little of Taylor’s religious point of view other than once saying he wasn’t very religious, though he relayed that viewpoint while telling us that he called for a day of prayer! It could be that the fact that all Taylor’s papers were destroyed in the Civil War while in his son’s possession have obscured our fully knowing Taylor’s religious outlook. I’m so glad I chose this volume as my read on Taylor. Perfectly paced for my needs and genuinely interesting, this book served up Taylor with nice balance, appropriate depth, and fleshed out in an economy of pages. Worth looking this one up! Valley Forge. Now that’s a subject worthy of its own book. If nothing else, there’s George Washington. Washington attracts great writers you know. Ron Chernow was compelled to give us a life of Washington while David McCullough gave us 1776, so it’s no surprise to me that the bestselling author team of Bob Drury and Tom Clavin were pulled to Valley Forge. Valley Forge made for one of the greatest chapters of Washington’s celebrated life and contributed immensely to his mystique. Drury and Clavin give it the treatment it deserves in this fine book. The authors struck the right balance in setting up the famous winter in Valley Forge, telling its story, and describing what followed along with its significance. Part 1 tells us of a series of failures that led into the dismal winter. Wait till you read of Brandywine. That this book ends in great victory makes the whole story something of a microcosm of Washington’s amazing life. He had more losses than most any famous general, yet he always preserved to ultimate victory. Defeat never crushed him, the odds never defied him, and he is the poster child of fearlessness in battle. He could rally men that seemed beyond it. All in all, he makes for thrilling reading as this book turns out to be. It would be unfair, though, to call this only a biography of an episode of Washington’s life. There are all kinds of heroes and villains to be found. For example, you will despise Charles Lee by book’s end. There’s plenty more across the field among the Redcoats too. The famous winter is great drama as well. The suffering was real—so real that the victories in the following spring seemed unreal. My only complaint with this book is that the authors were perhaps more skeptical of some of the Christian elements than seemed necessary. I know legends always have a potential of growing, but the evidence of Washington’s genuine Christianity is greater than what’s found here. If you love either Washington or the Revolutionary War, or for that matter any well-written slice of history, you will thoroughly enjoy this book. Dr. Benjamin Rush is a Founding Father that I’m happy to finally get to know. Famed historian, Harlow Giles Unger, delivers Rush from his inexplicable obscurity in this fine biography. The subtitle “The Founding Father who healed a wounded nation” is in no way hyperbole. If you love biography, you’re in for some pleasant reading. If you love early American history, you’re going to wonder how you’ve missed Dr. Rush for so long. What an incredible person was Dr. Rush! He signed the Declaration of Independence, was dear friends with many of the more famous Founders and faced personal danger for favoring independence from Britain. He loved medicine and people and continually damaged his own finances to help the less fortunate. He was “first” in so many categories—humane treatment of wounded soldiers, medical treatment for the poor, prison reform, and psychiatry. He stood up to anyone it took, including Washington, to push these things he felt were right. Every chapter of this biography makes you admire him more. Beyond just providing great biography, Unger skillfully handled the medical aspects of Rush’s life story. That Unger comes from a long line of doctors was a big help. Rush was involved in a few medical conflicts and was a proponent of “bleeding” patients. This biography will show that though bleeding was a mistaken treatment, it was based on the best medical science available. Rush studied hard and accumulated research that was a great help to later researchers. He was slandered unmercifully, yet never abandoned his medical calling. Unger also relates Rush’s Christianity. He doesn’t probe it or determine it’s influence on who Rush was, but he doesn’t obscure the fact of it either. The reader can do his or her own analysis. I was fascinated at Rush’s efforts to get to the bottom of Jefferson’s beliefs. It almost amounted to witnessing. Jefferson respected him so much that he opened up to Rush when he usually preferred to keep his religious views to himself. Since Jefferson’s views were not too orthodox, Rush suggested they agree to disagree. Another nugget of this biography is the relating of how Rush reached out to both Adams and Jefferson to mend their differences and reestablish their friendship. That healing was as profound as his medical work in the young nation. It appears that he was the only man both so respected that he could have pulled this off. This biography is a treat. If you love early American history, it’s a must-have book. I loved it! Ron Chernow has struck gold again. After writing his earlier Washington, a book that many of us feel is the best presidential biography ever written, you had to wonder if that earlier success was the biggest competition for this volume. While I would rank Grant a notch below Washington, this biography stands triumphantly beside the author’s earlier work. This book even accomplished one thing the earlier book did not: I knew Washington was great, but Chernow convinced me that Grant was far greater than I ever knew. There were even a few astonishing similarities between Washington and Grant that may be easily overlooked because of their broad dissimilarities. Both had an annoying parent, both had financial difficulties both before and after their presidencies, both persevered at times with health difficulties, both were loved as a general even more than as a president, and both were revered at their death on a scale that few others could duplicate in American history. In this work on Grant, Chernow makes Grant so alive that by book’s end, you feel you know him so well that you could anticipate what it would be like if he walked in the room, sat down, and begin talking to you. Though Grant was notoriously one to keep his emotions to himself, he was unable to hide them from Chernow. The portrait is so exquisitely drawn that we have the timbre of Grant’s voice, even if we lack the pitch of one who lived before the days of recordings. Chernow doesn’t hide Grants faults. His fine trait of seeing people without guile sunk him to naïveté and made him the sucker for countless hucksters. His amazing powers of concentration were at times counterbalanced by his lack of counsel. His drinking blackened his eyes at times throughout his career even if he inwardly hated it and appeared to conquer it several years before he died. Chernow is not as explicit with Grant’s faith as he was with Washington, but the fault was likely Grant’s. Grant’s life-long trait of holding so much inside robs us of knowing how sincere his Christianity was. We do learn in this book that he was raised in a Methodist home, and though his dad was unscrupulous in the extreme, his mother had a true piety. Grant was never known to use foul language, nor to have any substantiated trouble with women. In fact, he was a gentlemen’s gentleman in that regard. We do know he was a faithful churchgoer, attended revival meetings with D. L. Moody, and had a pastor often around him in his final days. Chernow shares the disputed stories of how sincerely Grant wanted the baptism he received in his final days. Some say he loved the idea while others say he did it to please his wife. Chernow draws a good picture of Julia Grant as well. She was a homely Southern Belle, more ambitious than her husband, held grudges, got caught up in the glory of the White House, and seemed to have little of the Methodist piety that her husband grew up with. Still, she loved her husband and he loved her. She believed in him when it even didn’t make sense. This book never lags. With 959 pages of text, it is quite long, but I can’t imagine what could be left out. Grant’s life of struggle before the Civil War had as much drama as a novel and made for great reading. As you would’ve guessed, the portion of the book that covered the Civil War was enthralling – both the writing and the subject were thrilling in this section. The misnomer of Grant the butcher is thoroughly laid to rest. He was an accomplished general, wrongly overshadowed by Robert E. Lee, and was both relentless and fearless in battle. Along the way, you will have a good overview of the Civil War without ever sinking into the dryness that afflicts some historical writing. When you pick this book up, you are preconditioned to think that Grant’s life after the Civil War is boring, but I still couldn’t put the book down and found it all fascinating. His presidency was far more than the caricature of scandal that has been wrongly attached to it, even if the scandals were real. He wanted to preserve the gains of the Civil War and was sincere. It wasn’t until after his presidency that I soured somewhat on his character as one who was becoming too egocentric and one too easily piqued toward others. But then his determination to care for his wife and write his memoirs brought him back to the Grant I had grown to love. This book is a tour de force! It could serve as a virtual clinic on how to write historical biography. Chernow, though perhaps not as well-known as the beloved David McCullough (though a play called Hamilton may have changed that observation), must in no way defer to him with this masterpiece. I’m confident that this will be THE biography on Ulysses S. Grant for my lifetime. This book is so wonderful that it makes you ask: what’s next, Mr. Chernow? If the trend of jumping to the next century and finding the general who lead its most important war and later became president, it must be Eisenhower. Whoever it ends up being, I’ll be in line to get and read it! Peter O’Brien is one of the most respected scholars of our day contributing some of the most trusted commentaries we have including an outstanding one on Hebrews in the Pillar Commentary series. Here he has expanded those studies that would have made the Introduction of his Hebrews commentary too long and especially delved into the theology of Hebrews. Unlike some such volumes that I have seen, he discusses what can actually be found in the text and mines its significance to grasping the unique and powerful Book of Hebrews. Chapter One addresses God revealing His Son. He sees the clear tie to the Scriptures and even explains how Hebrews uniquely presents scriptural quotations. His reflections were powerful in this study. In chapter two he traces how Hebrews presents Jesus as the perfect High Priest. Jesus is not only superior, but His sacrifice is as well. The next chapter continues that thought to the salvation Jesus provided. He then discussed the people of God receiving this salvation. He gave a huge chapter on the warning passages that make for fascinating reading no matter if you fully agree or not. Those passages are both unique and central to what Hebrews is giving us and I appreciated him drawing it out so well. O’Brien continues his outstanding work here and I highly recommend this volume. I wonder if any of you are like me: you read so much in a few areas that you fail to read in other great areas. I read so much on Bible study, theology, and ministry that I miss other helpful things. For the preacher particularly, it is this kind of broader reading that will imbibe realness throbbing with life into our preaching. That is not to say we should just read anything of the millions of books printed. Pablum is all around us! But there are wonderfully enriching books too. Great literature, non-fiction writing including biography and history can all made distinct contributions to our lives. I want to focus on non-fiction in this post. Here are four outstanding titles that will stick with you for a long time. 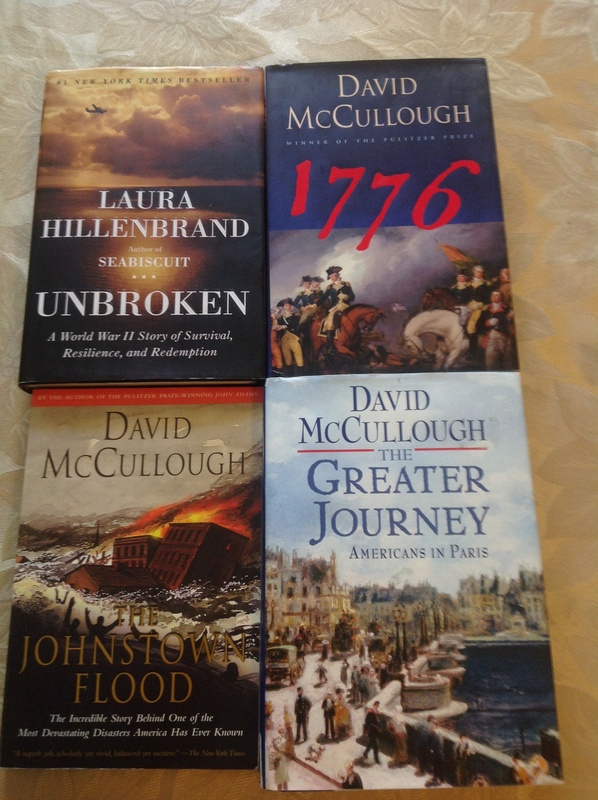 You may notice that three of the four are by the same author—David McCullough. When you find an author that really connects with you, you should feel free to go to that well again and again. As a prelude to this post I went to my Goodreads account and looked at several of my friend’s reviews there and noticed that many, and especially the preachers, had some of these kinds of titles listed. I may add other reviews of this sort later and so I will kind of make this post the hub for reviews or discussion on non-fiction titles (though I plan a separate one for Presidential Biography). I would love to hear recommendations from others since many of you may have read more than me in this category and I personally need to expand. Just send me a message or use the comments section of this blog. What a story! A friend, Mike Montgomery, recommended this title to me. As he described the book, I noticed he could recall more facts than one could usually muster from a book previously read. I thought then that book must have been special to have gripped him so. I later read it and it was all of that and more. It is the story of Louis Zamperini. A rough-and-tumble youth finally guided by a loving brother to run track, he rose all the way to the Olympics and even met a pre-WWII Hitler. Later called into service in the WWII Pacific Theater, he was shot down and spent a harrowing 47 days in shark-infested waters on a raft with little food. This part of the story alone would have made an awesome book, but then he was captured by the Japanese. His suffering at the hands of the Bird, warden of the prisoner camp, are beyond description. Ms. Hillenbrand did a great job in telling the story, so much so that you continually wanted to get your hands on the Bird as you read. There are so many interesting things, so much determination, but you can read and find out yourself. He got saved after the war and his quest to go and forgive his tormentors is a challenge to all Christians. Ms. Hillenbrand is not a Christian writer, but did little to obscure this telling fact. The recent film made of this book is fairly good in following the book, but stops short of what really explains his life. As is proverbially the case, the book was better than the film. The first book written by the Pulitzer Prize author that is as gripping as any he wrote. Forgive the triteness of saying this was better than fiction, but it was. Drama, intensity, tension—this volume had it all. Since it was history, you knew as you read that the dam would break and agonized over the choices made by some. Then the description of the flood itself was as exceptional writing as I have ever seen. They call his writing style the “documentary method.” Whatever it is, it will stay in your memory a long time. A masterpiece! In an interesting book idea, McCullough takes our history of one year (1776), but the one year that we teetered to the point that it could have easily gone either way. George Washington rises to the top as the man, who despite modern critics, is every bit the hero some of us think he is. Defeat and failure do not crush where they so easily could have. The Battle of Brooklyn, the escape that should not have worked, the Christmas surprise, all changed our formally disappointing prospects. More than a Washington biography, other generals, like Greene and Knox, prove their mettle. Here is a real page turner! This volume has not garnered the praise that some of his others have, but that is only because the subject was not quite as thrilling. The writing itself is still of the highest standards. It seems to me that in his John Adams biography he became fascinated with the French influence of our earlier history. That influence is as dramatic as he came to believe and explains more about American history than most imagine. It connects the dots of the country we came to be. Perhaps it does not end on a dramatic high, but it is a pleasurable read.